Contemporary battle staffs trace their lineage to Napoleon Bonaparte’s Grand Army. This staff concept is employed in a multitude of variations by every major military today. Battle staff officers are warfighters at the operational-level of conflict. They work on behalf of the commanding officer and employ a myriad of technical expertise and knowledge. There are three levels of battle staff, S, G and J staffs. S staffs work for a field grade officer, a major, lieutenant colonel, or colonel at the battalion, regiment, or brigade level. G staffs work for a general officer, brigadier general through general at the division, corps or army level. And J staffs work for a general or admiral at the joint task force level. What follows is a fundamental overview of the most prominent battle staff positions at the S staff battalion and brigade level, their roles and responsibilities, and the tools they use or develop as a product of warfighting. This is not a “how to” article on operational warfighting. For that there is a 10-month school, the US Army’s Command & General Staff College at Ft. Leavenworth, KS. Additionally a reference for operational warfighting already exists, the Battle Staff SMARTbook (The Lightning Press). Yes, another shameless plug for our sponsors – but let’s be honest here, if our reader is already serving on a battle staff, they’re already aware of the best-selling SMARTbook series. Trust me. Commanders at the battalion and brigade level are called simply the “CO” for commanding officer. At the highest level of joint forces they are called the Combined Joint Forces Land Component Commander (CJFLCC, pronounced “see-jay-flick”). Regardless of their title, commanders are responsible for the outcome of the mission. This is an enormous burden to bear, and they will directly interface with each primary staff officer and each subordinate leader at some point during the planning phase and execution phase of the mission. 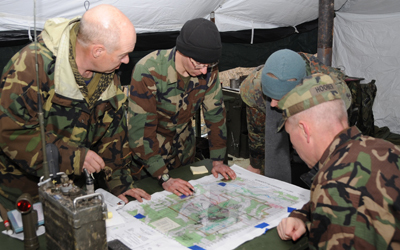 To aid in both the planning phase and execution phase, commanders develop two critical outputs for the mission – Commander’s Intent and Commander’s Guidance. Every staff estimate and each staff product continues to shape the commander’s understanding of the mission and the environment in which it will take place. This is a maturation process of situational awareness. Finally, commanders impart what is known as Commander’s Presence by getting to know each of his staff officers and subordinate leaders, and allowing them to get to know him as well. At higher levels of command such as division, theater joint task force, or Unified Combatant Commands (UCC), each responsibility under the commander is tasked to a separate officer – Deputy Commander (DC), Chief of Staff (CoS), and Executive Officer (XO). At battalion and brigade level, the XO is almost invariably also the DC, ready to pick up the battle in the event of the CO’s absence. Furthermore, the XO also plays the role of CoS with the purpose of controlling and coordinating the staff through the battle rhythm. The battle rhythm is typically a spreadsheet product used to synchronize the battle staff through the Military Decision Making Process (MDMP). In addition to the numerous XO and DC duties, the CoS duties include coordination and control of all Commander’s Update Briefings (CUB). The Command Sergeant Major (CSM), addressed as simply “Sergeant Major”, is the senior-most enlisted Soldier or Marine in the battalion or brigade. It is said amongst enlisted troops that there are only two Soldiers who wear stars, generals and sergeant majors. Interestingly, like a general officer, the sergeant major does not wear the collar insignia of his or her career specialty. They are generalists at this level of expertise. The CSM answers directly to the CO and is the advocate for all NCO and enlisted troops in the unit. The CSM, like all staff officers is responsible for a staff estimate, with the CSM focused on the training proficiency, safety, plus health and wellness of troops to conduct the mission. Necessarily then, the CSM commonly interfaces with the S1 and S3 (Training), as well as Chaplain services, medical staff and each company’s first sergeant. The S1 Personnel Officer’s area of expertise is troop strength management during the planning phase, and casualty replacement operations during the execution phase. During the planning phase, the S1 employs and updates the Timed Phased Force Deployment Data (TPFDD, pronounced “tip-fid”) to keep track of force deployments for use in theater from various staging areas. The S1 interfaces continually with the S2, S3 and S4 staffs in regard to personnel management and casualty replacement during all phases. The S2 area of expertise is in Military Intelligence and counterintelligence operations. The S2 helps the CO develop all aspects of the Commander’s Critical Information Requirements (CCIR), and this serves directly in the shaping of the Intelligence Preparation of the Battlespace (IPB). During the MDMP, the S2 plays the role of the Opposing Force (OPFOR) for course of action (COA) wargaming and analysis. Through this process facts and assumptions of each COA are identified. The S2 interfaces with all other staff personnel and works very closely with the CO and S3. It is often said that all staff officers are equal, but the S3 is the “most equal”. The S3 Operations Officer is the hub of the battle staff. In the simplest terms, the S3 is responsible for implementing MDMP during the planning phase in order to develop the Operations Plan (OPLAN) until it becomes the Operations Order (OPORD). The S3 commonly plays the role of the battalion or brigade forces (BLUFOR) during COA wargaming. And during the execution phase, the S3 communicates Fragmentary Orders (FRAGO) to subordinate commanders. Though again, this is an oversimplified description of the S3 roles and responsibilities – which may include a separate S3 Training staff to ensure the force can achieve the mission. It is imperative then that in addition to working with all other staff officers, the S3 works closely with the CO and XO (CoS). Perhaps the most underrated warfighter on the battle staff is the S4 Logistics Officer. After all, counting beans, bullets, batteries and band-aids is a thankless and inglorious job. Yet it is here in logistics that entire battles and indeed wars are won or lost. Admiral Isoroku Yamamoto was a leader who wisely mastered this nuanced influence of battle. It is said that he warned the Japanese War Council prior to the Second World War that he could deliver victory for Japan for one year before the American logistical might would turn the tide and crush the Empire of Japan. His warnings were not heeded, and yet it came to past. During the planning phase the S4 develops the Logistics Estimate for the battalion or brigade. Additionally, the S4 develops the Combat Service Support (CSS) Execution Matrix to coordinate CSS operations for each COA generated. It is critical then that the S4 is present during the MDMP COA wargaming process because the S2 must identify facts and assumptions through the S4 input. These facts and assumptions are absolutely vital to CCIR. The S4 Logistics Officer coordinates all CSS sustainment operations during the execution phase. This includes not only fuel, munitions and ration re-supply, but also casualty evacuation, vehicle recovery and maintenance operations, and troop transportation – as well as identifying main supply routes (MSR) and lines of communication (LOC) for each effort. The S5 Civil Affairs (CA) Officer uses Mission Evaluation Criteria (MEC) to coordinate with, enhance, develop, establish, or control civil infrastructures in operational areas to support friendly operations. The UN and NATO refer to this as Civil-Military Cooperation (CIMIC). To achieve this mission, the S5 interfaces with host national (HN) government as well as US and coalition Non-Government Organizations (NGO) and Other Government Agencies (OGA) outside the Department of Defense (DoD). Additionally, the S5 role may also include Psychological Operations (PSYOP) missions to disrupt enemy activity or to win the support of the HN civilian population. The S5 works closely with the S2 and S4 staffs to achieve CA and PSYOP missions. The S6 is responsible for the entire communication network for the battalion or brigade. The communication staff uses the System Planning Worksheet to develop networks that links the Tactical Operation Center (TOC) to subordinate and supporting units. The S6 Communications Officer enforces communication security (COMSEC) and proper use of the Signal Operating Instructions (SOI – Army, CEOI – Marine Corps). The S6 interfaces with every single staff section, all subordinate commands and units, as well as supporting units. Additionally, the S6 may be required to coordinate with coalition, HN, and NGO/OGA parties. The targeting effects (FX) cell is typically formed through a break-out working group. As such the cell leader can be assigned by virtue of the nature of the mission, either kinetic or non-kinetic (violent or non-violent effects). During kinetic operations it is not uncommon for a liaison officer from a supporting artillery or armor unit, or feasibly even the Forward Air Controller/Combat Controller (FAC – Army, CC – Air Force) to act as the targeting cell leader. Yet during non-kinetic operations such as humanitarian disaster relief missions, the targeting cell leader may be pulled from the S5 CA or PSYOP, and would certainly include representatives from the S2 and S4 shop. Whatever the mission, the targeting cell uses a Targeting Synchronization Matrix for various effects and Battlefield Operating Systems (BOS). The targeting cell uses an established method of Decide, Detect, Deliver, and Assess (D3A) when determining which effect is needed, what to target, how to best achieve the effect, and how to assess the impact of the battalion or brigade efforts. That is the modern battle staff in a nutshell. Is this an overly simplified description? Certainly. Furthermore, no two battle staffs are organized exactly the same way. The unit mission and Table Organizational Equipment (TOE) or Table Data Allowances (TDA) shape the battle staff organization. Yet what is critical is that we’re able to appreciate tactical warfighting in the framework of operational warfighting, and bridge between the two. For mission planning purposes it is important that we, as tacticians, understand how the battle staff supports our mission as well as how we link to the rest of the battalion and brigade.